Standardization derives from the need to create a community that enhances not only the needs of an individual but all other contributing members. While standardization bodies have only been present for the past century, the process of standardizing techniques for industry has been around even before the human species and occurred naturally for some time. The earliest technological industry that is known to have been used was the Oldowan Industry, which was widely standardized by early species of Homo such as H. habilis and H. ergaster. The Oldowan Industry (named after the location of its discovery in Tanzania) initially appeared at the beginning of the Stone Age, approximately 2.6 million years ago. This technology is recognized for making use of the first stone tools, which ultimately played a key role in the use of tools for the following millions of years. The main component of the Oldowan toolkit is a core, which is a large stone that acted as the primary resource for creating the tools. The core was struck by a hammerstone in a downward motion, which would fracture it, creating stone flakes or choppers, in a process that has been confirmed through archaeological evidence of the fracture marks left on the cores. One of the main purposes of these flakes and choppers was to cut flesh off bone to prepare meals. So how exactly is this evidence of the first standardized practices? 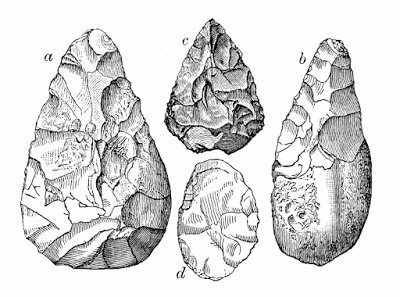 Remnants of Oldowan tools have been discovered by researchers all throughout Africa, Europe, and Asia, and were used in specific sites in globally distant modern South Africa, China, and Spain. Clearly all of these practices developed from the same source, since they correlate with the movements of human ancestors from Africa into Europe and Asia. Therefore, while these human ancestors would have likely derived from the same place, having these practices handed down to them through their preceding generations, each group of individuals would have decided (without the use of language) that it was the best method for them to utilize. In this way, this original standard was conformed to naturally until better techniques could craft technology that was more advanced. This occurred 1.8 million years ago, once the Acheulian Industry, which is characterized by bifaced blades and handaxes, became the standard. These drawings indicate the handaxes used in the Acheulian toolkit. Since this time, humans have greatly adapted upon the methods of their ancestors to achieve technological interests that have enhanced the overall utility of society immensely. In addition to methods that purely enhance efficiency, standards now serve the purpose of securing the safety of personnel, making improvements whenever needed.